Expectations are a tricky thing. Unfortunately, this is one of those films that doesn’t live up to the hype for me, and it’s evident right from the underwhelming–but beautifully choreographed–opening scene. 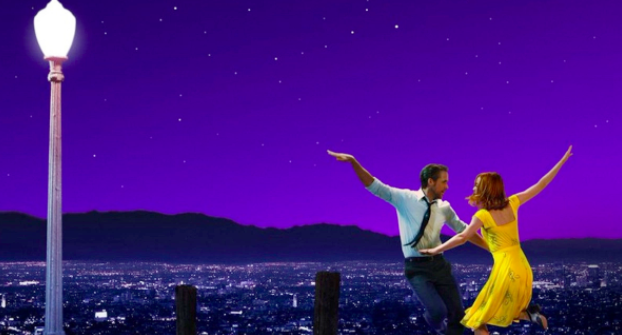 The film is stuck in a limbo between an intimate small scale romance and an extravagant large scale musical, and Chazelle’s desire to dip his toes into both results in an underwritten romance and through line. Committing to one or the other might give me a reason to care about more than just the aesthetics, but the film as it is believes it can be a masterpiece if it puts beautiful scenes next to each other sans connecting tissue. It’s understandable why Chazelle might think that way, though, as the scenes themselves are gorgeously crafted. They’re the work of masters of precision: Mandy Moore with the choreography, Linus Sandgren with the photography, David Wasco with the production design, and Tom Cross with the editing. They’re the product of a passionate cast and crew with an open-hearted appreciation of music, movie-making, and the city of Los Angeles. They’re the culmination of decades’ worth of movie magic that Damien Chazelle has stored somewhere. Simply put, these musical sequences are frequently enchanting to watch, but they never quite gel with each other or with the story. For instance, the ending is fantastic as a set piece, but it doesn’t truly have a film’s worth of buildup to drive it. That aside, there’s still something quite refreshing about seeing this getting the recognition that it’s getting. It’s hard to deny that the entire project exudes passion, that Chazelle, Gosling, and Stone (she’s great, but I really want to see Melissa Benoist in this role) didn’t pour their hearts and souls into this. It’s nostalgic, melancholic, and relentlessly optimistic, and it’s an ardent expression of love during a time so desperately in need of films like this. It also isn’t afraid to let physicality take center stage or to shine a spotlight on a man and his piano and nothing else. As Sebastian and Mia walk through Griffith Park during magic hour, their conversation eventually evolving into a tap dance illuminated by the beautiful sky above, you get the sense that there is something just right about what you’re seeing. As Sebastian saunters out onto a boardwalk, the dreamy tunes of “City of Stars” accompanying him, you start to feel like this is a world you want to inhabit yourself. And as Sebastian and Mia float off into space, the shackles of reality falling to the ground while they spin into fantasy, you feel like there is no dream or person or state of living not worth chasing in this world. Eventually, you have to come back down to earth, but it doesn’t have to be a hard landing. -Up from a B to an A-. Up 10 or so spots in my rankings. Unexpectedly large jump. -This time around, the strengths (i.e. the musical sequences) were magnified while the weaknesses (i.e. the writing in the pre-finale second half) weren’t as weak. I have some of the same criticisms I had after the first time, but those detracted from the viewing experience much less this time. Still not sold on John Legend’s role in the film, but on the whole, the characters, romance, and transitions between scenes were more believable. Knowing what to expect and look forward to actually helped me become more invested in the central storyline. It also helped to have an entire week to listen to the score. -When Mia turns away from the mirror during “Someone In the Crowd” and walks back out into the party…I know there are a ton of beautiful Magic Hour shots in the film, but this might just be my favorite shot overall. The light snow, the people frozen mid-dance, the colors, the quiet theme building back up in the background…absolutely heart-stopping. -I think I accepted along the way that this isn’t a character study (not that people are going in thinking it is); rather, it’s a study of a situation that the film’s characters are involved in, that situation being the state of being in LA/being a fool who dreams. The same goes for Whiplash, though that film had to–and did–feature a more compelling central dynamic. There’s nothing wrong with breathtaking musical sequences lessening the load on the character front, though. Different films have different focuses, and the same general weakness may have wildly varying impacts on different films. -Boardwalk scene, tap dance scene, engagement party scene…all gorgeous. My favorite remains the Griffith planetarium scene. As for the opening scene: the song is amazing and the sequence is good, but I still find it to be the weakest musical sequence of the entire film. I don’t know if expectations are still playing a role here. -The audition scene is masterful. Much more impactful for me the second time around, and it’s the film’s climactic expression of catharsis. It’s the film’s thesis beautifully expressed in several minutes, and Emma Stone kills it. -Some bumps to get to the finale, but what a hell of a finale. Brings everything together in a glorious montage, and fitting it’s a fantasy. This whole film feels like one. Also: “Epilogue” blends together the entire score seamlessly. So impressive. -Whose idea was it to release this wide(r) on Star Wars weekend? My screening was maybe 10-15% full. Opening weekend evening showing. Goddamn it. I guess I was fooled by the word in your opening – underwhelming. I was expecting a lower rating in your film review. But I guess a B is decent enough. My thought was that since the New York Film Critics Circle awarded this the Best Picture of the Year, I was hoping that it would be spectacular and memorable. Like something between West Side Story (young star-crossed lovers), An American in Paris (splendid dancing), and Singing in the Rain (music and dancing). But those are true classics and Chazelle may need a longer and richer filmography before grabbing some Oscar gold for himself. On the other hand the NYFCCA always seem to be announced too early and before some of the other major contenders for Best Film have even been released. Yeah I still enjoyed it well enough for a B. I did want to love it though. It is the type of movie that would win though as it’s a musical about Hollywood. I’m just glad that the Best Picture race seems to be between three good movies: Moonlight and Manchester being the other two. Silence could be a spoiler, we’ll see. It exceeded my expectations, but I respect your points. I love this kind of film, so it would be hard for me to find a flaw. I’m glad it did! Thanks for reading.